Engineering durable adhesive tape for excellent bonding and resistance to corrosion, chemicals and abrasion on pipes, bends, fittings, reducers and more. Shawcor offers a range of field-friendly tape systems for pipeline protection. 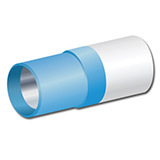 End Seal Tape is a durable plasticized PVC tape, featuring a modified pressure-sensitive adhesive. The rubber-based adhesive was developed to exhibit outstanding water resistance, while excellent abrasion and chemical resistance is achieved due to its highly flexible and tough backing. 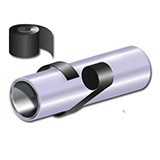 End Seal Tape can be applied over the entire pipe end, thus protecting the steel, or just over the coating/steel transition area or to minimize moisture pick-up and coating disbondment due to moisture undercutting. WrapidTape™ consists of a crosslinked polyolefin backing, coated with a protective, heat active anti-corrosion adhesive which effectively bonds to steel substrates and common pipeline coatings including polyethylene and fusion bonded epoxy. The WrapidTape™ products are designed to offer superior protection on bends, fittings, reducers and other pipe structures where a typical WrapidShrink™ product cannot be applied.